The Stinger P9 is a very useful and good-looking airsoft pistol. The Stinger P9 is truly one of a kind with it’s mind-blowing accuracy, durability, FPS, and the price tag of only $20! It’s made fully of plastic, with the exception of some springs, but I assure you, it’s very well made. My personal one has been dropped multiple times in the heat of battle, and still runs flawlessly. From extended abuse, the weight located directly behind the handle may come off, but without any glue or anything, you can snap it right back into place. The Stinger P9 also might get dirty on the inside after a month or two of warfare. It’s very simple to take it apart. Just push out one of the pins, and the slide will come right off. The Stinger P9 is a compact little gun with a good punch. At 275 FPS (Feet Per Second), it’s great. Though, FPS comes at a cost. The hop-up is very loose, even brand new, straight fresh out of the package. The hop-up being very loose will cause your BB to shoot extreme up. That’s why I highly recommend using high-grade .25 gram BB’s only for this gun. Anything less won’t hurt the gun, but it will be horribly inaccurate. But, even with .25 gram BB’s, it still shoots somewhat high, but this is just one of those down sides that you just have to live with. Just keep the nose down, and it’ll work fine. Just a side note, also, this gun is extremely reliable. I’ve never seen it jam, misfire, or any other malfunction you can think of. Most airsoft pistols are meant for a effective range of around 20-30 feet. But, the Stinger P9 can hit a person from over 50 feet away (using .25 gram BBs)! This is a great gun for all types of players, new or advanced, sniper of heavy gunner, infantry of scout, for target practice or skirmishes, this gun is like the utility tool of airsoft, it does it all. What I really love about the Stinger P9 is it’s magazines. They have a 80 round reservoir, which is a huge advantage in airsoft matches. They’re super cheap, too, averaging around $6. If you buy a simple pistol magazine holder, and four extra magazines, you can be unstoppable. 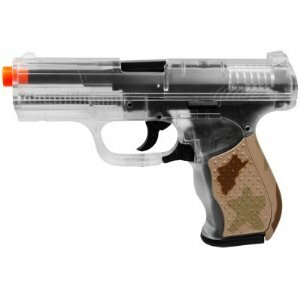 So, if you’re looking for a inexpensive, reliable, accurate, powerful airsoft pistol, this could be your golden ticket. Like I said; the utility tool of airsoft. It can fit pretty much anyone’s needs. And it’s light and compact enough to wear in a leg holster if you needed. Between it’s power and extreme accuracy, it’s personally my favorite spring pistol, and I carry it as a sidearm to all my airsoft matches. This entry was posted in Beginners, Intermediate, Pistols, Review, Spring/Bolt Action and tagged p9 airsoft, p9 airsoft gun, reliable airsoft pistol, sinper airsoft pistol, sniper pistol, stinger p9 airsoft, stinger p9 airsoft gun by sirbuffalosushi. Bookmark the permalink.